Proprietary Cycles Predict July Turning Point for Stock Market - Technical Traders Ltd. - Investment Strategies, Analysis & Intelligence for Seasoned Investors. Think of this research post as an early warning that June and July 2019 are likely to be a very critical price inflection point based on our proprietary price cycle analysis tools. Back in October 2018, we predicted the downside price rotation almost perfectly going forward 4 to 5 months. We predicted nearly every move that occurred in the US stock market all the way to and through the ultimate low that occurred on December 24, 2018. You can read that post here. 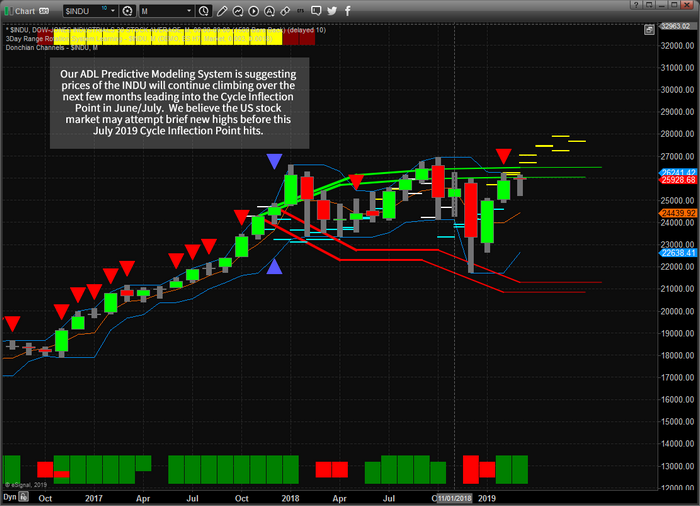 Now, our predictive modeling systems and cycle systems are predicting a June/July 2019 cycle inflection date that will likely coincide with, possibly, new market highs as well as increased bullish price activity throughout the global stock markets until we get nearer to this date. This June/July 2019 date becomes even more critical as we begin to understand our other predictive modeling systems are suggesting that precious metals will begin an upside price advance near late April or early May 2019. 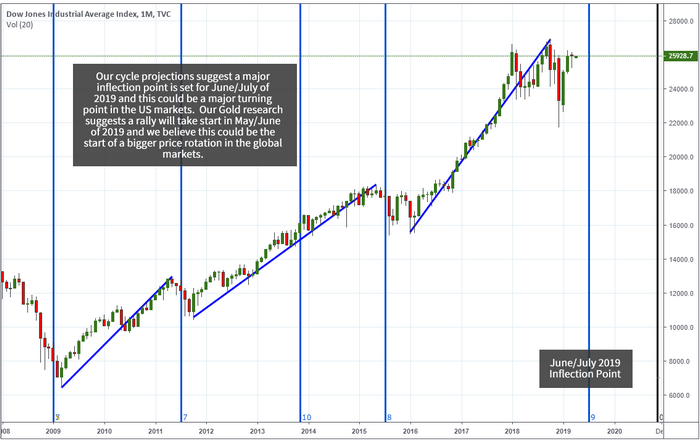 When we combine this analysis and start to consider the broader conclusion, it leads us to believe the global stock markets could be poised for a bit of rotation after May or June of 2019 – possibly setting up a bigger price sell-off throughout the end of 2019. Only time will tell. This Monthly DOW Industrial chart highlights our cycle inflection points/dates in vertical lines. The next, pending, cycle inflection point is June/July 2019 on this chart. We believe continued upside price bias will prevail over the next few months resulting in lower Gold and Silver prices. As we near these June/July dates though, we could see an increase in volatility as well as a decrease in US Dollar valuation. This would align with a “risk on” transition away from equities and into protection assets like Gold and Silver. Our Adaptive Dynamic Learning (ADL) predictive price modeling system is suggesting that an upside price bias will continue over the next 2~3 months headed into this June/July cycle trigger. The ADL is also suggesting that the US stock market may reach near all-time highs just before the cycle inflection date hits. We do believe that some moderate price rotation is likely over the next 60 to 90+ days as price rotation is a key element of price advance or decline. We are suggesting that, for right now, traders should continue to expect moderate upside price bias, with some expectation of price zig-zagging its way up, over the next 2~4 months. Should our cycle inflection date prompt a market reversal, we will likely know more about the risk factors that could prompt this move at least 20~30 days before the event begins to unfold. We are posting this research post to alert you to a cycle trigger/inflection point that is 3~4 months away that could become a major event in our future. As we've suggested in this article, we don't believe this inflection point will change the way we trade next week or the week after that, but we do expect the closer we get to this critical inflection point – the more important it will become for skilled traders. Our team has 53 years of experience in researching and trading makes analyzing the complex and ever-changing financial markets a natural process. We have a simple and highly effective way to provide our customers with the most convenient, accurate, and timely market forecasts available today. Our stock and ETF trading alerts are readily available through our exclusive membership service via email and SMS text. Our newsletter, Technical Trading Mastery book, and our Trading Courses are designed for both traders and investors. Also, some of our strategies have been fully automated for the ultimate trading experience.